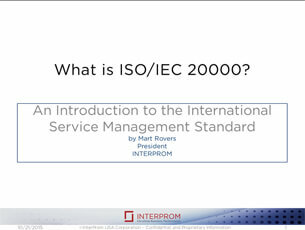 Presentation – What is ISO/IEC 20000? ISO/IEC 20000 is a worldwide service management standard that describes the implementation of an integrated process approach for the delivery of services. It consists of a set of minimum requirements to audit an organization against effective Service Management. The standard promotes the adoption of an integrated process approach to effectively deliver managed services to meet the business and customer requirements. This presentation introduces the reader to what the standard is all about and why organizations choose to meet is requirements. It also describes the certification process and it has useful hints, tips and links.